My next season co-driver and I installed the brakes on the yellow car today, and bedded them in. The car's sitting in front of the house now, cooling off, with all brakes off, just in gear to keep it from rolling. The new brakes are grabbier than the OEM ones, and it will take me a day or two to get used to and to modulate the input accordingly. They also are producing some noise, but that's the trade-off for running performance pads. 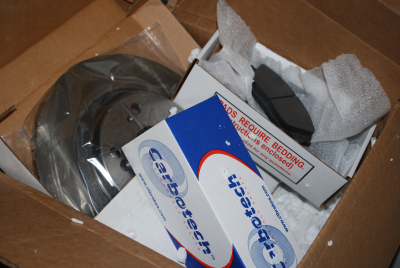 The Carbotech AX6--designed for autocross--are supposed to be quieter than say, their track pads, so I won't complain. A little brake noise in exchange for increased stopping power is not a high price to pay.